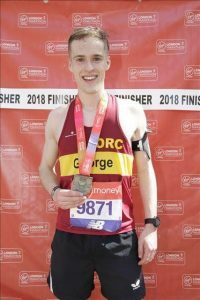 Seven Okehampton Running Club members took part in the 2018 London Marathon which went down in history as the hottest one ever. Having trained through months of cold and wet weather the runners were completely unprepared for running in temperatures of 24 degrees and strong sunshine so thoughts of PBs and best ever London runs had to be shelved. First home for the club was Paul Carter in an extremely impressive 3.06.00. 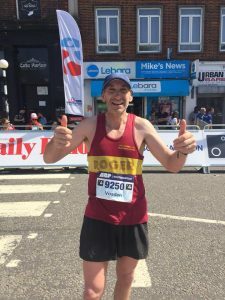 Paul was in great shape, his training having gone very well and had been hoping for possibly a sub-3 hour finish, but he soon realised this wasn’t going to be achievable in that heat and slowed just a little to a more suitable pace. His run was made harder when at mile 22 he found he had lost his last gel, meaning he had to run the last few miles on empty. Having completed Barnstaple parkrun the week before London in 18.22, giving him 82.3% age graded percentage, the highest of the day, and the Taunton Half Marathon at the beginning of the month in 1.22.18 with an age graded percentage of 85.6%, Paul starts the new Awards year with three platinum awards already. Charlie Galley was next home, running in memory of his father for the David Shepherd Trust, a charity helping wildlife in Africa and named after the famous wildlife artist who was a personal friend of his father’s, also a very talented wildlife artist. Charlie felt slightly disappointed with the second half of his race where the heat made him slow to well below his normal pace but still finishing in a very respectable 3.37.45. George Haskell was one of only two in the club to get his place through the general ballot and was running his first ever marathon. He ran a very well paced race, especially for a first-timer and was really pleased to finish in 3.44.58. Jackie Dawes was the first ORC lady home, having earned her place through a ballot within the club for the one place Okehampton is allocated based on its membership. She did herself and the club proud with a finish time of 4.21.07, just 1min 30secs slower than her previous run there, but if the conditions had been more favourable she would have undoubtedly set a new PB. Heidi Wills had been really lucky in getting through the official London ballot this year having run the marathon last year with the club ballot place. She took the opportunity to raise some money for the Force cancer charity, and was quite pleased to finish in 4.35.13 given the heat and the fact her training hadn’t gone as well this year. Both MaryCarol De Zutter and Kathryn Volkelt-Igoe had already got marathon places through their previous clubs, Reading Roadrunners and Devizes Running Club, before moving locally and joining Okehampton. MaryCarol had deferred this place last year having been unwell so had to take it up this year or lose it. She finished in 5.44.17 and is now looking forward to getting back to her preferred off-road running. For Kathryn this was her third marathon and she was pleased with her time of 5.48.15 given the heat, but promising that it will definitely be her last marathon. With not many local races this weekend Okehampton Running Club members had to travel some distance to race and three ORCs went to separate venues, all of them running 10k races. 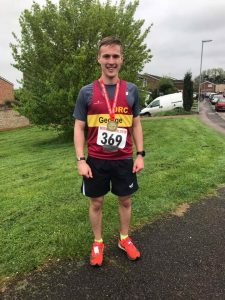 George Haskell had taken a week’s holiday after his marathon debut in London and came back to run the Flitwick 10k with the intention of just taking it steady round the undulating course. However his legs had recovered much more quickly than he had anticipated and instead of a having a jog round he ran a great race to finish in 39.32, setting himself a new personal best and going under 40 minutes for the first time. 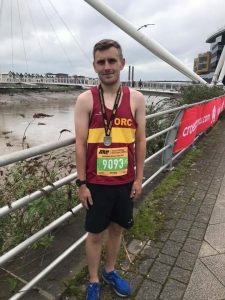 Hayden Bond made the journey to South Wales to take part in the inaugural Newport 10k, held on the same day as the established Newport Marathon. The route starts and finishes on Newport’s riverfront, with a flat and fast course passing some of Newport’s most iconic landmarks and the recently revamped city-centre. Having recently run his first half marathon Haydon chose this as his first 10k and set himself a very good time of 41.53 as his first PB. 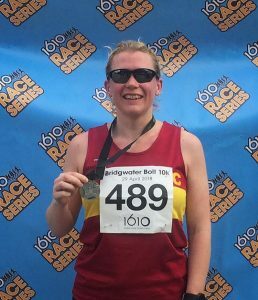 Jo Page has raced nearly every week since joining the club and seems to be getting quicker with each one, this week running the Bridgewater Bolt 10k. As you would expect in this part of the country the course is predominantly flat with a nice mix of urban and country scenery and just a couple of small hills to contend with. Jo yet again set herself a new PB, finishing in 47.04 to come third her age category. 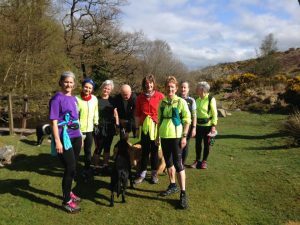 …..and, not forgetting the wonderful Moor runners! 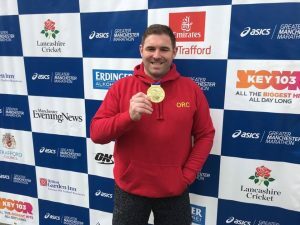 While most runners attention was focused on the London Marathon last weekend, there were some other races going on with Club members out there competing in them. In Southampton there were three races, a full marathon, a half marathon and a 10k and Okehampton had a runners in both the marathon and the half. Yet again the weather affected the performance of the runners, but instead of rain or snow it was the heat that made for uncomfortable running conditions this time. Roger Voaden ran his 75th Marathon, a two lap course of the Half Marathon, finding it hot and tough going but still enjoying the run and finishing in 3.35.09, while in the half, Jo Page ran herself a PB, just a week after setting it at the Tavy 13, coming home in 1.47.53. Much further away Mags Jarvis decided that as the Bodmin 5 Tors was cancelled this year she would try a challenge with much more climbing and greater distance not too far from her daughter’s home, called the Clwydian 10. The Clwydian Hills are in NE Wales and the famous Offa’s Dyke runs along the ridge. The highest point is Moel Famau at 554m. The race was just a bit short of 10 miles with 3000 ft of climbing. Thankfully here the temperature was much less than in Southampton, at a comfortable 13°C and luckily they finished before some heavy showers. Mags ran with her daughter Sarah on the whole route, finding the race small, friendly and scenic. They finished in 2:21 with Mags being 15th out of the 39 ladies taking part and 1st W60. Okehampton Running Club also had seven members running the London Marathon and there will be a report on how they all faired next week. A fantastic variety of running this weekend. The season has got off to a great start. You are all such inspirational people of all ages and abilities, what a club we have! The re-scheduled Tavy 13 Half Marathon, postponed due to the snow in March, took place on Sunday and saw a good turnout . A few who had been due to run on the first date couldn’t take part this time, but there were still 12 runners from the club to take on this hilly course. Unfortunately the weather still wasn’t great with some rain and breezy conditions, but this is not the easiest of courses so the runners were happy with the cooler conditions. The race starts and finishes on the athletics track at Tavistock college with a course that takes the runners out to Dartmoor and back and, although there are two tough hills at miles five and eight, the last three miles are mainly downhill. Roger Voaden, back to road racing after his ultra two weeks ago, was the first home for the club in 1.29.41 to come 14th overall and 2nd MV50. Just two places behind him, having had Roger in his sight for most of the race, was Hugh Robinson, pleased with his time of 1.30.39 as he is still coming back to fitness after an injury lay-off. Newcomer Hayden Bond had a good run round a tougher course than he’s tackled so far finishing in 1.39.41 with Mike Baker coming home in 1.45.12 and John Binns in 1.50.04. 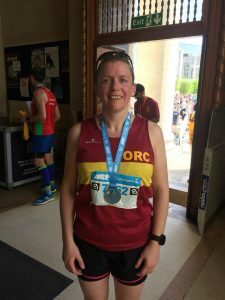 First ORC lady home was another newcomer, Jo Page who has thrown herself into the racing scene with enthusiasm since joining the club. She ran only her second ever half to score a huge PB finishing in 1.50.04 and having run a 10k race in the same week while working in London, where she clocked 45.08 for the Orchid London River Run. Cathy Carey and Jo Camies had a good run together finishing in 2.00.46, followed by Anne Binns well into her training for the Exeter Marathon in 2.03.15. Christine Fritsch and Charlie Collyer also ran together, both of them making a rare appearance at a road race, usually preferring off road running, and were pleased with their time of 2.05.19, this being a new PB for Christine. Phil Read has also had injury problems recently and was happy to complete in 2.05.39. 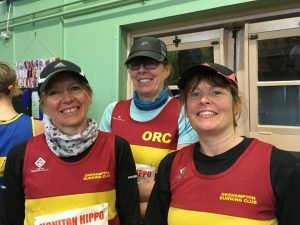 The wet weather didn’t make a huge difference to the runners at the Honiton Hippo where being wet and muddy is part of the enjoyment of the race. Three Okehampton runners took on this seven mile race that takes runners along undulating woodland paths and across some boggy fields, with two river crossings and ample mud. Carole Cornwall and Katy Speak had experienced this race before but in much drier conditions, enjoying the race more this time, while it was the first time Tracey Mills had run it. Carole and Tracey finished together in 1.40.52 with Katy just behind in 1.41.24. Further away there was a lone ORC, Deborah Cunningham, running the Great Welsh Marathon at Llanelli on Sunday. 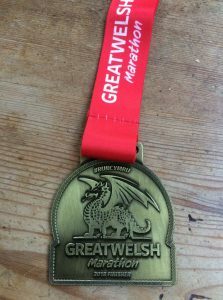 This race is a double out and back which is repeated twice on the Millennium Coastal Path which overlooks Llanelli Beach and the Gower Peninsular. This does however make the course very exposed to the elements, with no protection from the wind or rain which can turn a flat potential PB course into a tough one. Unfortunately these were the conditions experienced by the runners on Sunday but Deborah did well to complete in 4.53.40, raising over £800 for the Young Minds charity by doing so. 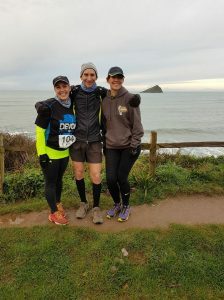 The Easter long weekend saw the culmination of months of training for three Okehampton Running Club members when they took on the Devon Coast to Coast Ultra Marathon. This is a 117 mile crossing of the county from south to north, following the Two Moors Way and run over four consecutive days, although there is an option to complete it non-stop in under 48hours. All three ORCs, Roger Voaden, Jo Turner and Ali Holiday, took on the four day race, going home after completing each day’s section. The weather wasn’t very kind to them making this huge challenge even more difficult and the conditions underfoot appalling. 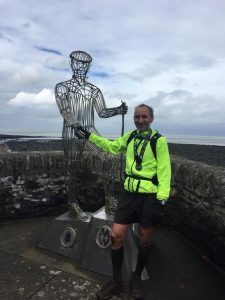 Day one saw them set off from Wembury on the south coast, and follow the Erme Valley Trail initially with a mix of gentle trails, woods and tarmac to Ivybridge where the Two Moors Way starts and then continue on to Holne where day one finished. The rain did hold off for this day at least and all three made good time, with Roger Voaden finishing joint first with a German runner in a very good time of 4hrs 55min for 29 miles. Day two, the Dartmoor section, was much worse however, with a bitterly cold wind and rain so that by the time Jo and Ali made the checkpoint at Bennetts Cross they were so cold and soaked there was some question of them continuing. However a change of clothes and warm-up in the car saw them push on and thankfully the rain did stop, but when they eventually finished at Hittisleigh Ali was beginning to be troubled by a painful knee. Roger had finished ahead of all the other runners in 5hrs 5mins having covered the 25 brutal miles in shorts! Despite some desperate physio and icing of the painful knee, after just three miles of day three Ali was in pain again. She was determined to finish however and carried on, but after fifteen miles she couldn’t bend her knee and her ankle had also become painful, so she very reluctantly had to retire. This section through Mid Devon was very demoralising with field after field of mud to trudge through without respite, but once again Roger came in joint first in 5hrs 30mins. The final day was perhaps the toughest with so many miles in their legs and the expanse of Exmoor to cross to get to the finish at Lynmouth. After another night of heavy rain most of the paths were like streams or were muddy and slippery and fields had standing water on. Jo was now running with another lady and although very tired was going well. Roger too was running with someone new, a runner who was full of running on the final day but had been much slower on the previous days. As they ran along the seafront at Lynmouth Roger allowed this runner to go ahead of him by a few paces, letting him officially finish first for that day he’d told Roger he had never won a race. Having won all the previous legs though Roger was the undisputed overall winner of the whole race, a great achievement for someone used to running all his marathons on tarmac. He finished the final leg in 5.29 making his cumulative time for the entire race 20hrs 59mins, an incredible time especially given the conditions. 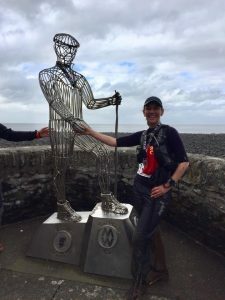 The race officially finishes when the runners shake the hand of the ‘Wire Man’ on the seafront and still smiling, but very tired Jo shook his hand after 8hrs 16secs happy to have completed but promising herself she would never run a multi-day event again! 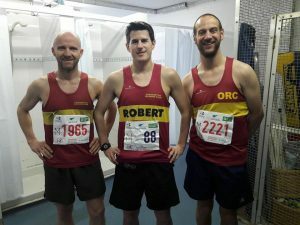 The first of the spring marathons took place last weekend with Okehampton Running Club having runners at both the Taunton and the Manchester Marathons. After all the bad weather of the Easter weekend the conditions on Sunday were just about perfect for marathon running with light winds and no rain. At Taunton just one ORC took part in the full two lap marathon with three doing the one lap half which takes the runners along pleasantly undulating country lanes with no steep hills. In the marathon Rob Kelly enjoyed a terrific run to record his second fastest time ever, finishing in 3.04.48 and running the second half of the race faster than the first. In the Half Marathon there were PBs all round for our trio of runners. First home for the club was Paul Carter, incredibly setting a new PB at 51 years of age, finishing in 1.20.16 to come 6th overall. Ed Dumpleton is finishing every race with a new PB at present and he continued the theme here by knocking 1minute 45secs off his previous best to finish in 1.33.57 despite not having done any long runs for over 6 weeks. New member Hayden Bond also had a great run to improve the time he set at the Bideford Half by a minute, coming home in 1.34.53. Further away Gas Williams was running his second marathon, taking part in the Greater Manchester Marathon which has a finish in the Emirates Old Trafford, the home of Lancashire Cricket Club. Gaza’s previous marathon had been at Bournemouth and he improved on the time he’d set there by 7minutes, finishing in 5.04.05. At the Exe to Axe 22 mile race on the South West Coast Path two ORCs, Stephen Gentle and Andrew Thorne, took on this point to point race which is in fact tougher and longer than the iconic Grizzly, though it lacks that race’s status among runners. Stephen had a brilliant run, coming 19th overall in a good time of 3.21.26 while Andrew Thorne completed in 4.23.22. With just a week to the end of Okehampton Running Club’s awards year, members were out this week trying to fill in gaps in their awards charts or to upgrade ones they had. A one mile time trial was held on Tuesday evening with eight runners taking on the challenge to run a mile on the Granite Way as fast as possible. Six of these were new members to the club who hadn’t had a chance yet to get a one mile time, one of them, Jo Page, only having joined the club that evening. Ed Dumpleton had already done a time trial earlier in the year but his running has improved so much this year he thought he could better it, and he certainly did, knocking a sizeable 18 seconds off to set a new PB of 5.26 and upgrade his award to gold. All the newcomers ran well setting times they didn’t know they were capable of but would hopefully be able to improve on as they do more training, while Jane Jackson ran her first time trial for two years and was pleased to attain her platinum award. 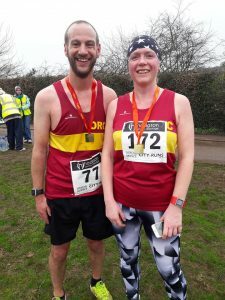 Three days later Ed Dumpleton and Jo Page ran the Fast Friday 10k in Exeter to have a crack at another distance that features in the club awards. The course of this aptly named two lap race on the roads around Exwick playing fields definitely has PB potential and both ORCs took advantage of it. Ed ran another PB, knocking over 30 seconds off his previous one to finish in 42.02 and come 2nd MV40, while Jo had never run a 10k before so simply aimed for a sub 50 minute run, but was very pleased and surprised with her finishing time of 47.54. With just one day left in the club awards year they both then had a shot at their 5k times, running in different Parkruns. Ed did the Exeter Riverside parkrun where, despite a very wet and congested course he did score a hat trick of PBs in a week setting a new time of 20.15. Jo had a holiday in Wales for Easter, so she took part in the Penallta parkrun where she too set a new PB of 23.09. The previous week two other ORCs went chasing 5k times at park runs, with Tom Andrew setting a new PB round the Tamar Lakes course with a time of 23.27, while Jane Jackson chose the relatively fast Barnstaple course where she achieved her platinum award with a time of 23.58. At the time of going to print Jo-Anne Turner, Alison Holliday and Roger Voaden were making their way across Dartmoor to bring their Dartmoor crossing Ultra to an end. Full details and the outcome of this will be shared next week. Not forgetting the start of springs brings with it the regular weekend moor running. Well done Janet and Ruth for finding a break in the weather to get out on the moor. Error: Error validating access token: Session has expired on Saturday, 20-Apr-19 03:20:42 PDT. The current time is Monday, 22-Apr-19 11:46:57 PDT.